We take a look inside the renamed Metro Goldwyn Mayer (MGM) studio. The foundations of the Sony Pictures studios, which incorporate both post-production facilities and a centrepiece scoring stage, were laid almost a century ago. In 1915, the real-estate tycoon Harry Culver founded Culver City, halfway between downtown Los Angeles and the Pacific coast, and built its first film studios. Only three years later, the lot was taken over by Samuel Goldwyn, and, after a merger in 1924, the company was renamed Metro Goldwyn Mayer (MGM). Even in those early days, the huge studio area, which had its own police and fire stations, was, in many ways, a city within a city. The dimensions of the control room are matched by the vast Neve 88VR mixing console. The building that now houses the scoring stage was built in 1929, originally as a filming stage, although even in its early years it was used for sound recording purposes from time to time. The soundtrack to the colossally successful 1939 film The Wizard Of Oz was recorded here, and subsequently the studio was used solely for sound recording. The list of classic films with soundtracks recorded at the MGM scoring stage includes such milestones as Gone With The Wind (1939), Ben Hur (1959), Lawrence Of Arabia (1962) and Doctor Zhivago (1965). 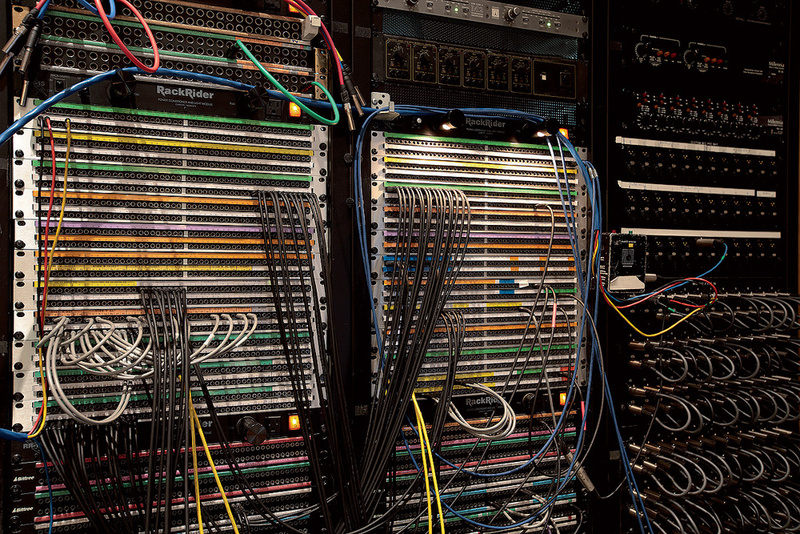 With a huge analogue console comes a huge analogue patchbay! 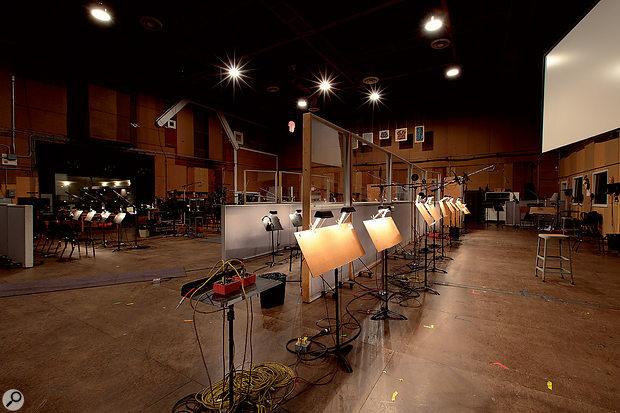 Unlike some long-established studios, the Sony scoring stage employs mainly modern high-end equipment rather than vintage gear. 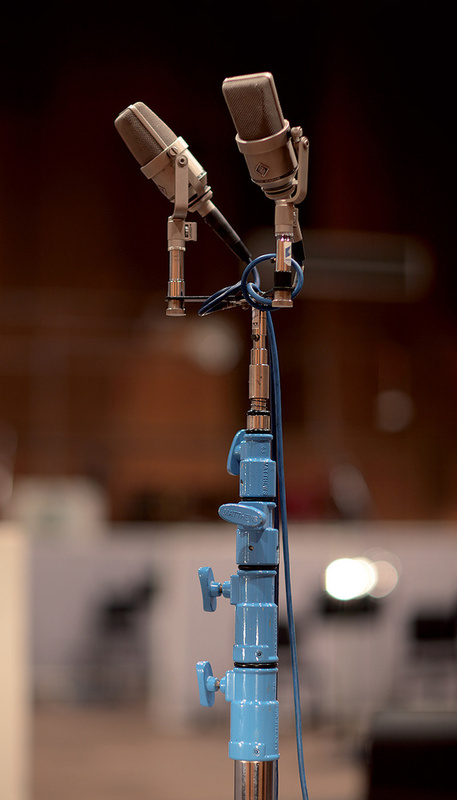 Here, a pair of Neumann TLM170 mics sits atop a heavyweight stand. 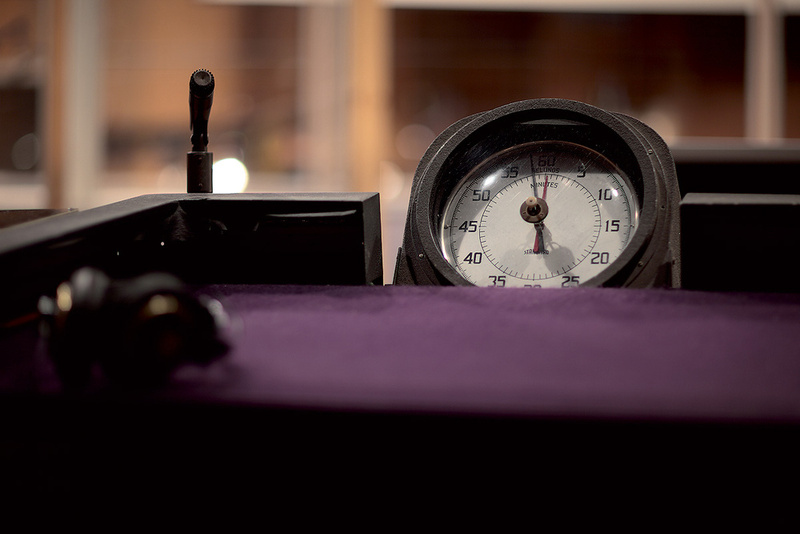 Timing is everything with film cues, as the presence of this clock on the conductor's desk testifies. In the 1970s, the entire lot was acquired by investor Kirk Kerkorian, and in the following years the filming and post-production studios changed hands several times, until Sony Pictures made them their global headquarters in 1990. They modernised and revitalised the 180,000-square-metre lot, and in 1994, the sound recording stage was renamed the Barbra Streisand Scoring Stage, honouring the diva who had recorded some of her most celebrated work on the premises. 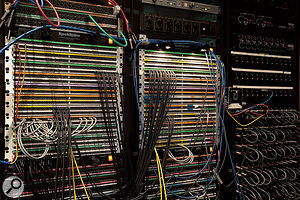 Despite everything, though, the 600-square-metre live room, one of the largest recording spaces in the world, remains almost entirely in its original condition. Only a few details of the room itself have been altered through the years, but the technical equipment is up to the most modern of standards. 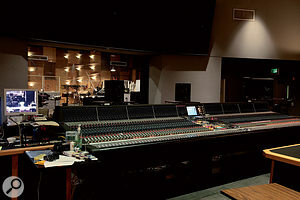 The studio, which is still known as the MGM Stage by many industry professionals, is equipped with a cutting-edge Neve 88R console featuring 96 input channels and 192 inputs with motorised faders during mixdown. 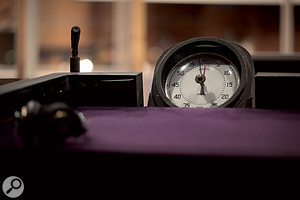 The layout of this desk has set a standard which other important studios, such as the Newman Scoring Stage featured in July 2012's Studio File (/sos/jul12/articles/sf-0712.htm), have also adopted. To date, the largest recording session at the Sony Stage has hosted well over 150 musicians and vocalists playing at the same time. And in view of its immense capacity, it is no surprise that many recent classic film soundtracks have also been recorded here: ET, Schindler's List, Pirates Of The Caribbean, Black Hawk Down, Up In The Air, Transformers and Alice In Wonderland represent just a small selection of the stage's latter-day work.